Shipley Farms is home to the Shipley family who work together to care for their 440 Holstein and Jersey cows. This fourth generation farm has grown since the 1940s, but the family’s commitment to cow care and producing safe, wholesome milk has always been a top priority. 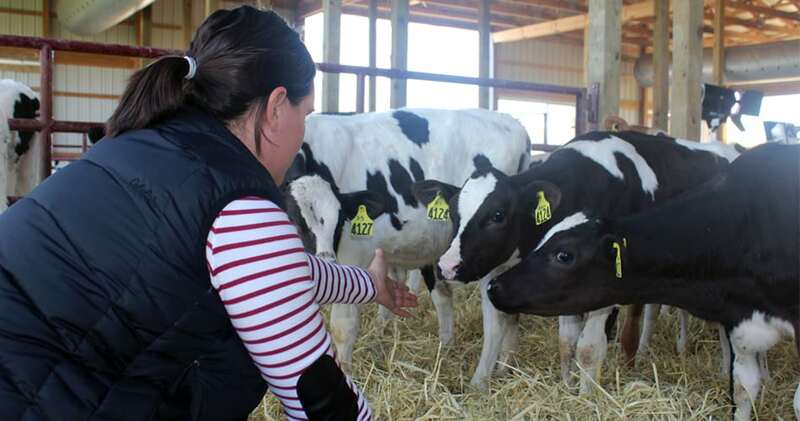 With a college degree in hand, why come back home to be a dairy farmer? Stacey: I wanted to come back because I really do enjoy working with the cows. I could go somewhere else and work, and probably make a lot more money and work a lot less hours, but I consider myself lucky to be around here and work with these girls every day. I majored in animal science at Ohio State and had a minor in ag business. Business is a big part of the dairy farm so I took a lot of business classes for that reason, and I also enhanced my knowledge of animal reproduction and nutrition. Do modern advancements in dairy farming have an effect on how your cows live day to day? Stacey: Today’s modern dairy farm is engineered around cow comfort. Research is done all the time on how we, as dairy farmers, can make our cows more comfortable. If they’re happy, we’re happy. So when we built our barn last summer we incorporated the latest research and best technology to ensure cow comfort. Regardless of size, we’re dairy farmers because we love it. Wouldn’t it be easier to manage a smaller farm with fewer cows? David: When our family started out in 1941, we had 10 or 15 cows. We thought we were as busy as we ever could be. We then had 40 cows but that wasn’t enough to make a living. Then the sons and grandchildren came in and we’re up to 440 cows now, but that’s still a relatively small farm. Stacey: Regardless of size, we’re dairy farmers because we love it. As many hours as you put in, you’d have to be crazy to do it just to make money. We want to make sure our milk is a safe, nutritious product for everybody to drink. I enjoy drinking the milk, and I want to make sure there’s plenty for other people to drink.